I’m so excited. 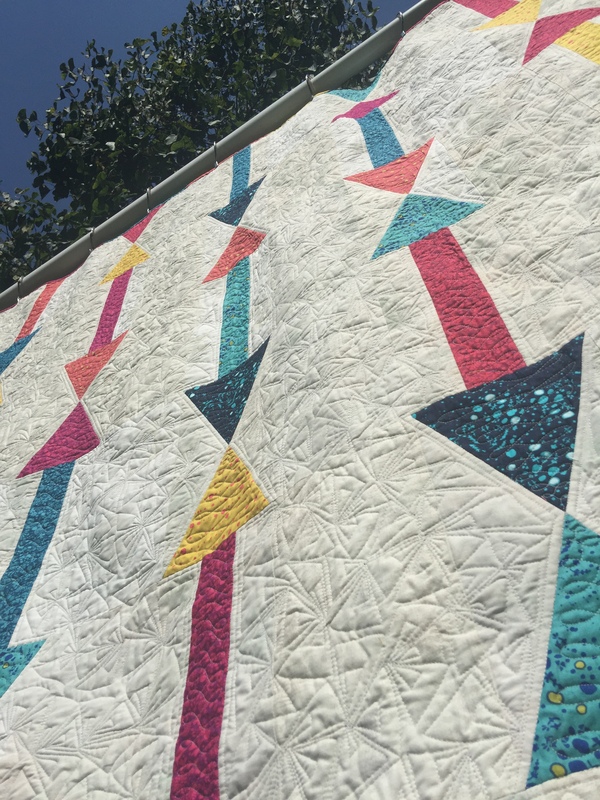 Today is my day to share on Christa Watson’s blog tour for her new book Piece and Quilt with Precuts. I chose to make the arrows quilt a bit smaller than the one on the book. I left two rows off the side and a row off the bottom so my quilt ended up being 66″ x 72″. I used 7 fat quarters from Alison Glass 2015 & 2016 Sun Print collections and about 4 yards of various Grunge whites for the background. Even after making the arrows, I still had enough of the fat quarters to make a scrappy binding. The quilt was super quick to cut and piece. I think I have no more than 5 hours total in making the quilt top. Quilting it was another story. I chose to quilt it the same way Christa quilted hers – with free motion arrows and cursive L’s. I had not tried either before so I decided this was a great time to learn something new. The instructions provided in the book were very clear and made learning these two new forms very simple. Her book mentions that both free motion designs are fairly intense so she suggests doing short sessions at a time. I would agree. The maximum time I could sit and quilt the arrows was 45-60 minutes. And even though the L’s seemed easier to quilt to me, I could only keep the motion going for about 20 min before they started looking funky. In total it took me about 10-12 hours to quilt the entire thing on my domestic machine. 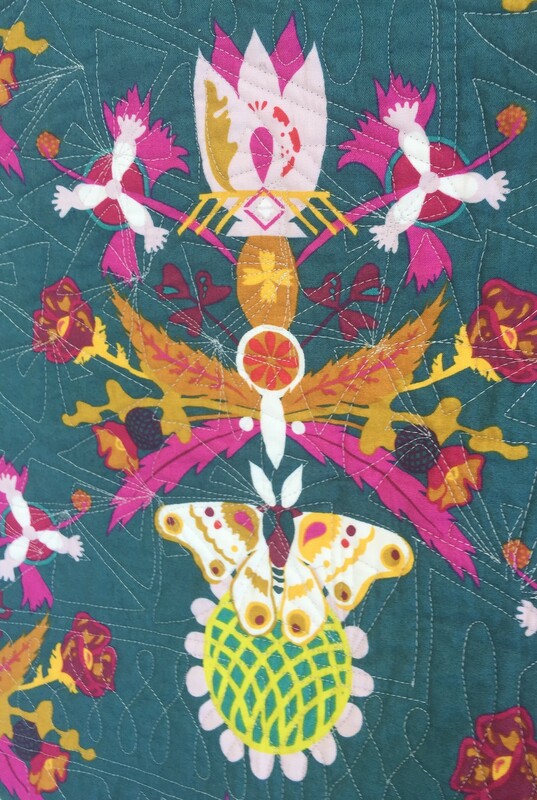 I backed the quilt with this fabulous Allison Glass print from her Ex Libris collection that perfectly matches the front. So three different Alison Glass collections in one quilt and they all go together like they were meant to be. It also shows some of the quilting. GIVEAWAY CLOSED. MaryD is the winner ** GIVEAWAY #1 ** I’m giving away an electronic copy of Christa’s new book here on my blog courtesy of Martingale Publishing. 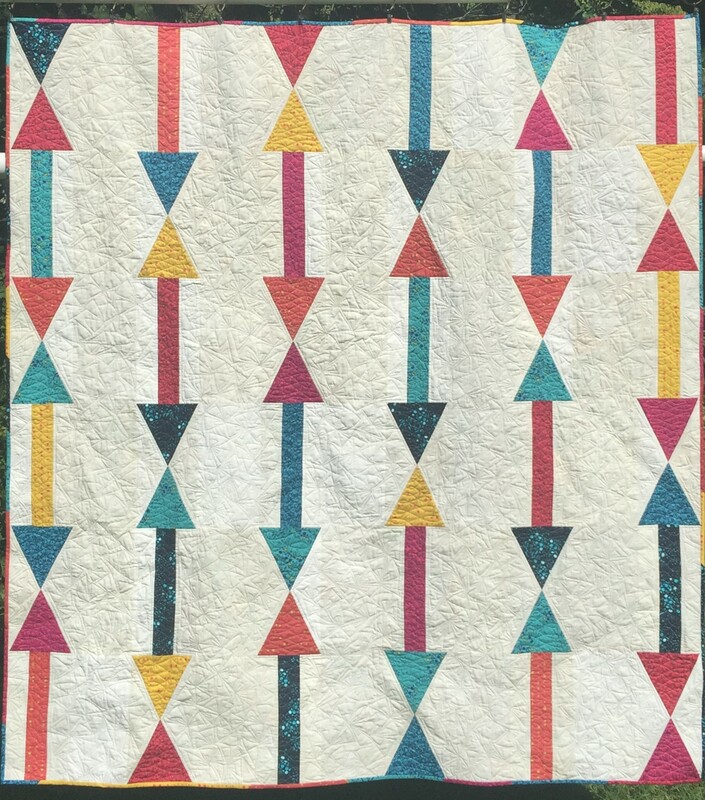 Just leave a comment telling me your favorite quilt from Christa’s new book, and if you have a private account be sure to leave your email as well. Giveaway open through August 31. Or you can buy a copy of Chrita’s book from her shop. Trust me You’ll love it. GIVEAWAY CLOSED ** GIVEAWAY #2 ** On my Instagram account, I’ll be giving away a fat-quarter bundle of the Allison Glass prints that I used for the arrows. Check out my Instagram feed for info on how to win. I am @monkeyneedle. And I would be remiss if I didn’t mention that you need to check out the other great bloggers that have participated in this fun blog hop. A full list is below. Click here to see Christa’s version of Squiggles. TUESDAY AUGUST 22 – S.W.A.K. Click here to see Christa’s version of S.W.A.K. I finally finished my scrappy wonky log cabin quilt top, and I HEART everything about it!! I love the scrappiness! I love the wonkiness! And I love how the bright blue solid brings it all together. You can read about why I started this adventure here. I share some tricks with you in making wonky blocks here. And I share with you how I squared up the blocks here. Now it just needs to be quilted and bound. I plan to quilt it sometime in August. I’m thinking an all over edge-to-edge design will do just fine. There is already a lot going on in this quilt, so it doesn’t need anything fancy. 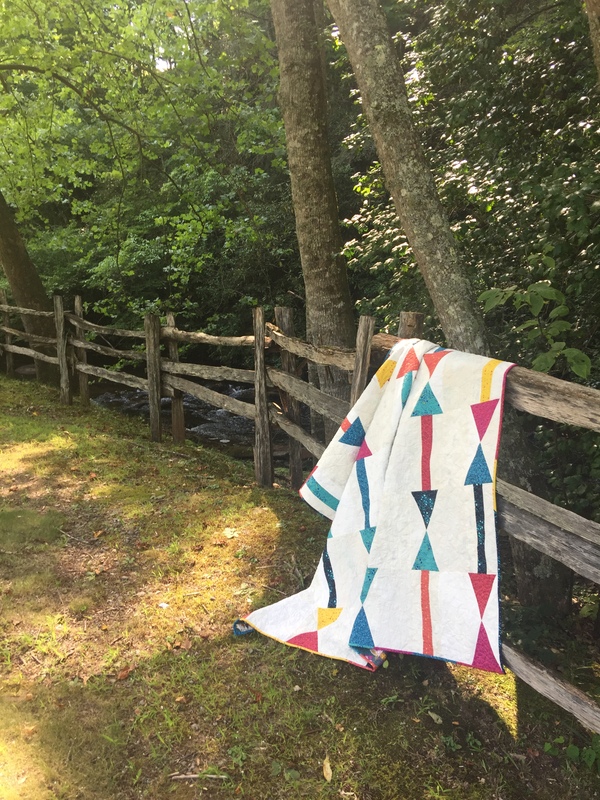 Although I love this finished quilt, now that the top is finished and I can get a good look at the whole thing put together, I think it would look really neat to make the wonky blocks in a wider range of sizes. Most of the wonky blocks finished at 11-12″ and then I added the blue to make a 13″ finished block. But it would also look great if some of the wonky blocks finished at 6″ or 8-9″. And then to not center the wonky block into the blue 13″ square but offset it a bit. There would be more solid blue in the quilt, but the variety of sizes, and offsetting the wonky blocks, could make the quilt more visually interesting. Hmmm… I might have to make another one day. And that’s another thing I love about quilting. 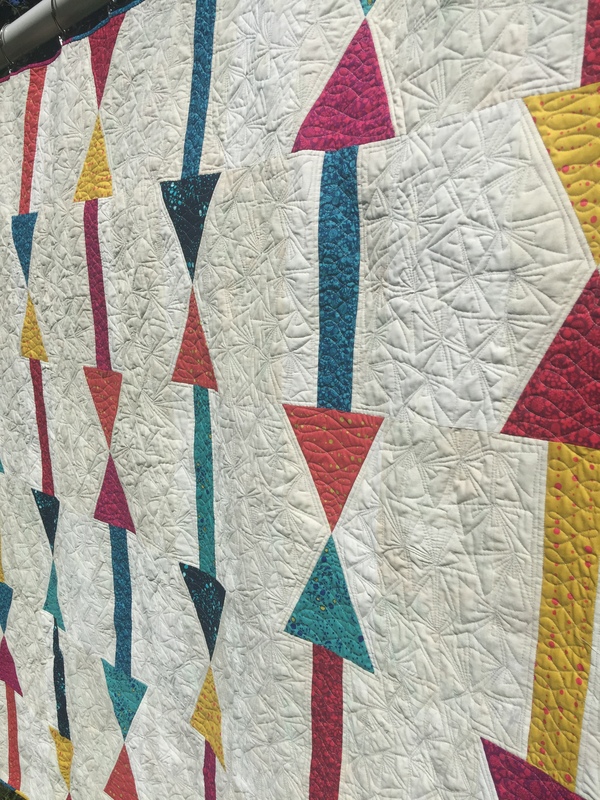 You can finish a project and completely love the way it is, and then think “if I change it up a bit here and there, how great would that be?” I never run short on ideas when it comes to quilting. I only run short on time. 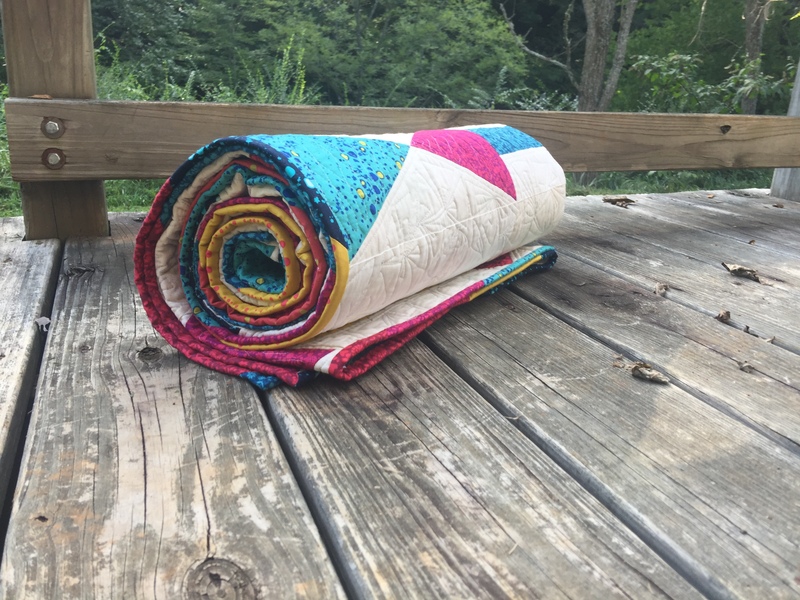 Linking up with Can I Get a Whoop Whoop at Confessions of a Fabric Addict and Finish it Friday at Crazy Mom Quilts. Remember the wonky log cabin blocks I’ve shared with you the last couple of weeks. Well I have all 35 blocks made now, and some of them are very wonky. I auditioned several different colored backgrounds based on solids I had on hand already. I decided I really liked the darker blue backgrounds. The blue I chose ended up being the one I had the most yardage of. I really liked the other one better, and I might have had enough, but it was just too close to be sure and I didn’t want to get 90% done and then run out. Turning them into a square, rather than a wonky, 13 1/2″ block has proven to be challenging. Not because it’s hard, because it’s not. I could just cut a strip the width I need (3″ wide should be largest enough for most sides), sew around all 4 sides, and then trim to be square discarding the parts that I trimmed off. That would be easy, but it would create a lot of waste and a lot of new scraps. In the example below, the piece I cut off is approximately 1 3/4″ on one end, and 0″ on the opposite end. Which basically means I can’t use this scrap on another block and it will have to go in the scrap bucket. Oh the horror! Remember the whole point of this was to use my scraps, not create more. So I have been challenged in how to square up each block with as little waste as possible. I started out trying to use a spreadsheet and that didn’t work. Eventually I moved on to a post it note that I could pin to each block. Still took me a bit to figure out how to measure what each block needed. Don’t worry about trying to figure out this mess. I’ll give it to you in a nutshell below. What I have come up with is to pair up the squares, and then to cut the strips wide enough so that what is cut off of one block is close to the right size to fit on a different block. I put the block on the left under the ruler centering it as best I could between the 13-1/2″ finished square size that I wanted. I’m working with just the right edge of that block right now. It measures 2-1/2″ from the top edge and 1″ from the bottom edge. (see below) Add 1/2″ to both of those numbers for the seam allowances for each fabric, and that means I need a piece 3″ wide on the top and 1-1/2″ wide on the bottom to finish the right edge of this block. The left edge of the other block I measured the same way, and for it I needed 1-1/2″ on the top and 2-3/4″ on the bottom (no picture). So I took either the top or bottom measurements, which ever were the largest in total and then added 1/4″ for safety. In this case, the top measurements were the largest so 3″ left block + 1-1/2″ right block + 1/4″ for safety means I need to cut the strip 4-3/4″ wide. Here is my 4-3/4″ wide strip between the blocks. I might trim 1/8″ off each of these in the end (remember we added 1/4″ for safety). Also, this method is taking about 10 times longer than it would otherwise, but at least I won’t have much wasted fabric when I’m done. So, in that manner, I’m meeting my goal. Also, since I cut a strip 4-3/4″ by WOF (width of fabric), I still have about 34″ left of that strip after the two blocks above. So I matched up more blocks that needed that same width (or close to it) and did the same thing with those blocks using up that entire strip I just cut. Do this same thing for all 4 sides of each block. I made 35 blocks, so in this case that’s 140 sides! Let me know if you would like to try this or if you have questions on how this is done. I can write up more detailed instructions. Now to work on squaring up more of these blocks. I’m ready to get this thing put together. If you want to read about how (and why!) I started this scrappy log cabin adventure click here, and I share some helpful tips and tricks here on working with wonky blocks. Last week I shared with you the Scrappy Wonky Log Cabin blocks that I was starting with the gazillion scraps from my 1″ scrap bucket. As I was working on these scrappy wonky blocks, I thought of several hints and tricks that might help should you decide to also make some of these blocks. 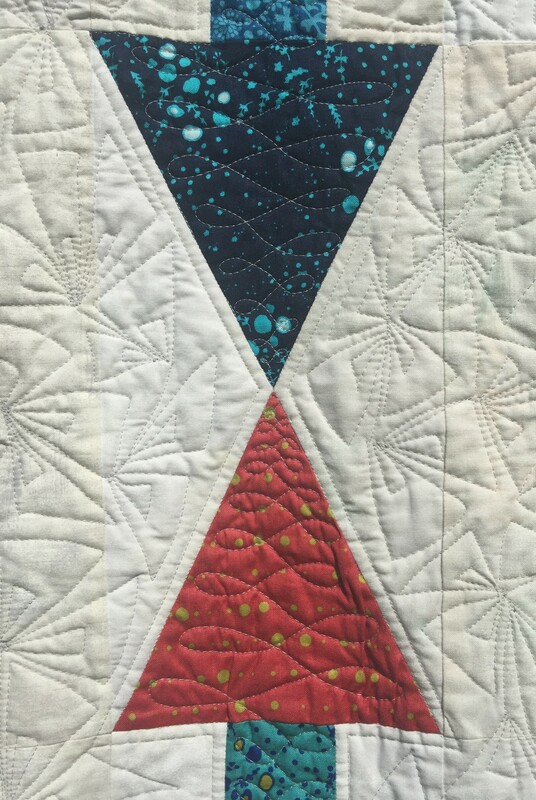 If sewing a strip to the block and there is an acute angle on a corner to which the strip will be sewed (in the block below both corners along that top edge are acute angles), or an angle pointing out, make sure you use a longer strip to account for extra length needed on that new strip when trimming. If I had used the same length of strip as the widest point on the side of this block before the new strip, it would have been too short if wanting to keep that same angle once trimmed. If scrap is a weird shaped, trim sides of the scrap first and then trim long edge based on where the straight edge of the sides ended. Trim the whole side, not just the end of the last strip sewed on. Sometimes, due to fabric stretching or not a completely straight piece of fabric, there is a little extra that needs to be cut off to make that side straight for the next strip. If the block is getting too wonky, and you want to square it up a bit, you can do that too. In this first example, my block is a bit too rectangular, instead of square, so I just needed to plan what the next couple of strips would be. By planning to sew a more narrow strip to the side and then a wider strip to the bottom my block will be more square once those strips are trimmed. Then in this example, my block is getting too wonky. The top is much thinner than the bottom, and after another round or two and it will be a triangle. Not a bad thing, but not what I am wanting here. So, I sewed a wider strip to one side, and then purposely trimmed that strip at an angle such that the wider portion is at the top of the block where the block was slimmer, and the thinner portion of the strip is at the bottom of the block where the block was wider. Although the other (left) side of the block is still not squared with the rest of the block, the block as a whole reads more square than triangle now. Next week I’ll share with you how I’m squaring these blocks up to the same size so I can sew them together to make a complete quilt top. I have shared with you before that I am a member of a group with do.Good Stitches that makes charity quilts. The group that I am a part of donates our quilts to Enchanted Makeovers, a non-profit organization that updates, or makeovers, shelters for abused women and their children. It’s has taken me a while to get this quilt finished. Well, that’s somewhat true. It did take me several months to get it finished, but then it took at least that long to get pictures of it. I didn’t have a good way to take pictures of larger quilts (this one is twin size). My honeyman was making something for me to hang large quilts from for picture taking, and he took his sweet time. But we finally finished so I was able to get some pictures and am now able to share this fun quilt with you. The finished blocks only needed to be within a certain size range. The idea was to fill in the space between the blocks with scraps of fabric to keep the ‘improv’ look throughout the quilt. I regretted that decision! It turned out great!! Ok, so it did take me a while to fill in all the spaces. It turned out to be much easier to do on excel, than to actually do it with fabric. I did a LOT of rearranging of the squares and a LOT of measuring. Followed by a LOT of praying when cutting into the fabric just hoping it would be the right size. And then I had to get very acquainted with partial seams. And sometimes I even had to take out a seam and adjust things. Here I am in the middle of trying to put it all together. I have the left half done. Just have to do the right half. Whew! I finally got it together and quilted. I love how FUN it turned out to be. Here is a close up of some of the blocks. I quilted it with a meandering loop-d-loop. And I washed it before taking pictures so it has a wonderful crinkly look and feel. I could just snuggle up under it. I also asked each member to make a fun additional block if they felt inclined. And one member did. She sent me a really cute dog. Since I didn’t have others, I found it very challenging to fit it on the front of the quilt, so instead it because the honorary quilt label on the back. A special thanks goes to A Stitch in Time quilt shop in Franklin, NC, for providing the fabric for the back and binding. If you’ve never been to this shop you really should make a special trip. It’s one of the most beautiful shops I’ve even been in, and the people are just the nicest! A couple of weeks ago I was working on scrappy heart blocks for a charity bee that I am part of. I was buried deep in my 1″ scrap bucket (Strips and pieces that I can make at least a 1″ square with. But in no case no larger than 1-7/8″ wide. Once they reach 2″, they go in the 2″ scrap bucket.) I used almost 200 pieces in these blocks, and other than the fact that there were scraps everywhere, on every flat surface and strewn all over the floor, when I put them back in the bucket you couldn’t even tell that I used any. The bucket has been overflowing for a while and I really couldn’t fit another scrap in it. I love how pretty these hearts turned out to be, but they honestly didn’t make a dent. So, I decided right then and there that I needed to make a quilt with those scraps. Since it was mostly full of strips, I decided to make a scrappy log cabin. This is only a small portion of the strips that I started with. My first thought was to use this as a leader-ender project. But once I started, I couldn’t stop! As I started forming the blocks, rather than squaring up the block with each round, I would let the fabric decide how the block would be shaped since I wanted as little waste as possible. Some strips were cut straight across, whereas others were cut at an angle. And if they were cut at an angle, I just left it there. I did trim them to create a straight line I could sew another strip to, but I didn’t trim to 90 degree angles. So not only were my blocks scrappy, but they were turning out to be very wonky as well. This is what they looked like after just 2 rounds. The plan is to stop when they reach approximately 11-12″, and then even them up with a solid color to be 13 1/2″ square. I have 23 blocks started above but will need 35 blocks at 13″ sq each to make a twin size quilt. Continue to read below if you want more detailed instructions in how I’m doing this. For each block, I started with a 2″ square and various lengths of strips. Start with 2″ sq center and various length of strips to go around. Also, since this method required a lot of trimming and ironing, I have a smaller cutting mat, ruler, and rotary cutter right beside my sewing machine, and the iron is just behind me. All I have to do is rotate my office chair and roll about 6″ to reach the iron. This saves me a lot of time because I’m not getting up every 10 seconds to walk to my normal cutting station. Sew on the next strip. Press the seam towards the strip just sewn on. Here you only need to trim the one edge where the next strip will go. Before we sew on anther strip to start the 2nd go-around, we need to trim all edges to be straight. You can see that I did not bother to trim the strips all to equal widths. I could do that and create a square log cabin block, but when I trim them this way, leaving any angles that were already part of the strip, this is what creates a wonky block. In the example below, it’s time to sew on another strip and start another trip around the block again. I have another piece of fabric that is cut at an angle. Depending on which way I decide to sew this on, I can create wonkiness on another corner. In this instance, I think I like the one on the left best but that really is a personal preference. Sewing it on the other way would not be wrong, just different. Tune in next week for an update on how this is coming along. If you’ve followed my blog for awhile you know that I make a couple of quilts for charity each year. I just finished a quilt for a group that I am part of called do. Good Stitches which is organized by Rachel at Stitched in Color. There are several groups and each group is made up of 10-12 quilters that stitch blocks and/or assemble and finish the quilt. I am a quilter at this time which means that I am also responsible for coming up with the design and colors for that month. For my month, I decided to use the Square Pegs pattern available at Moda Bake Shop. I asked the stitchers in my group to use their scraps and make blocks in melon colors. Think watermelon, cantaloupe, honeydew. And boy did they deliver. It’s so bright and fun. And will be a great quilt for the women that benefit from the makeovers done by Enchanted Makeovers, the charity it is going to. I quilted it with organic stacked half-moon shapes. The blocks are 13″ square. And because I asked our stitchers to make it scrappy, I had to refigure the instructions for assembly, but it was an easy pattern to figure out. It snowed this past weekend and the snow made the perfect background for this bright quilt. It was 8 degrees when we were outside taking the pictures. Just a little cold so I didn’t take many pictures, but thankfully I didn’t need to. Today, 5 days later, it’s 70 degrees. Gotta love NC weather!